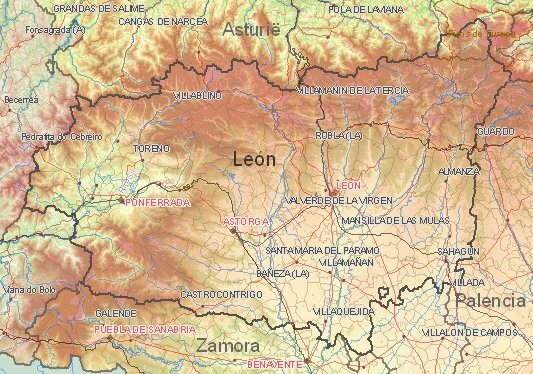 Holidays to the rural León in Spain? : City with a very impressive Gothic cathedral (Santa Maria de Regla). Other top attractions are: Palacio de los Guzmanes (parliament), Casa de Botines (Gaudi) and the parador (Monasterio San Marcos) outside the center. : City in the El Bierzo valley on the river Sil totally surrounded by mountains with the castle Castillo de los Templarios. : Spectacular scenery in Ponferrada (old gold mine from the Roman time). : Bishop City west of Leon with many religious buildings (churches, cathedral) and the bishop's palace of Gaudí. 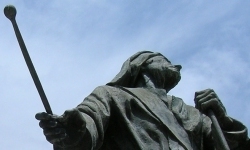 Soon León webcam, blogs, travelreports, spanish recipes and movie locations. 1) Current weather in Leon (temperature, precipitation).